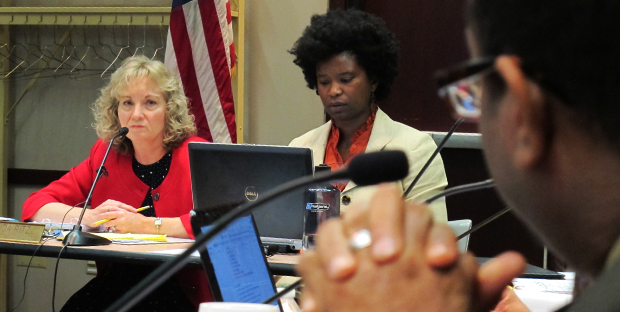 State superintendent Glenda Ritz looks on as State Board of Education member Tony Walker speaks during a board meeting in September. 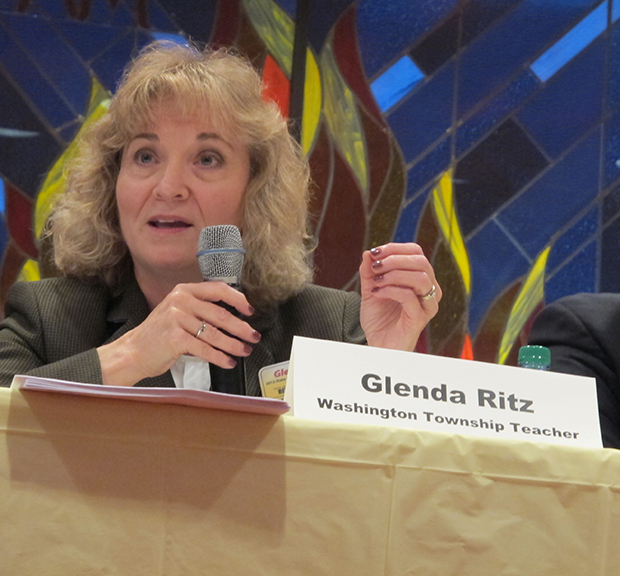 It’s a question we’ve been asking since Glenda Ritz ousted former schools chief Tony Bennett last fall — how well would Ritz, a Democrat, be able to work with Republican leaders who championed many of the initiatives she ran against? Tensions have been building for months between Indiana’s elected schools chief and the appointed State Board of Education. Ritz does not share the same vision for Indiana schools as the Republican governors who appointed the other 10 members of the board she chairs. 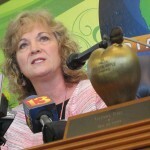 “It’s not cozy like it was under Tony Bennett,” David Dresslar, the executive director of the Center of Excellence in Leadership of Learning at the University of Indianapolis, told StateImpact earlier this month after Ritz tussled with the rest of the board over the agenda at the October meeting. That was before Ritz filed a lawsuit against the rest of the State Board over what she says is a violation of Indiana’s Open Door Law. On its face, the lawsuit is about a letter the State Board sent to legislative leaders about Indiana’s A-F accountability system. But beneath the surface is a complicated governance structure that has both sides saying they’re in charge. 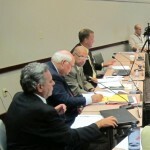 If Indiana’s State Board Violated Open Meetings Law, When Was The ‘Meeting’? It’s not the first time the state superintendent and the governor have been from different parties. Dresslar points out that in the 1990s, Republican Suellen Reed served under three Democratic governors. But during fellow Republican Mitch Daniels‘ term as governor, Reed found herself at odds with the State Board most often. Terry Spradlin worked for the Department of Education during Reed’s tenure. He remembers disagreements, but not outright squabbles over the agenda. “When it came time for her to decide to run for a fifth term, they tried to inconspicuously send signals they wouldn’t want her to do that,” he says. But the hostility between Ritz and the rest of the State Board of Education has been more overt. At the October meeting, board member Sarah O’Brien asked Ritz to move up a planned update from board staff, which the superintendent denied. That frustrated the rest of the board, Tony Walker and Dan Elsener in particular. “So you’re not going to recognize the motion? Is that what you’re saying?” asked Walker. “A motion and a second won’t be recognized?” Elsener pressed. After the meeting, Ritz told StateImpact she’s comfortable in her role as board chair. What happened at the October meeting was a nitpicky, procedural question about when State Board staff would present. But it was about something much bigger. Until recently, those staffers were also a part of the Indiana Department of Education. But that changed in August when Governor Mike Pence created a new education agency, the Center for Education and Career Innovation. The State Board’s administrative staff moved over to the new department and the board was allowed to hire its own legal counsel. At the time, Ritz said she had no idea the governor planned to create this new agency until Pence made it public. 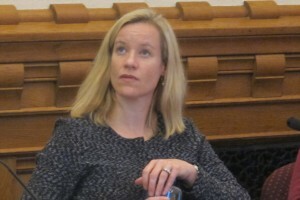 Claire Fiddian-Green advises Governor Mike Pence on education matters. But Ritz says she didn’t know the governor planned to create this new agency until Pence made it public. “I think there was a misunderstanding that somehow the creation of this center was taking something away,” says Claire Fiddian-Green, Pence’s special assistant on education and co-director of the new agency. She says it didn’t make sense to have the Department of Education act as the fiscal agent for the State Board, and so state lawmakers gave the panel its own line in the state budget. According to statute, the State Board exists to establish educational goals for Indiana schools. It’s Ritz’s job to implement those policies. But in practice, it’s messier than that. Take the calculation of A-F letter grades — that’s what started the latest dust up between Ritz and the rest of the board. The State Board of Education wrote the rules that govern the state’s accountability system. The Department of Education calculates the grades. But it’s the State Board that issues them to schools. Complicating things, this spring the Indiana General Assembly sent the A-F accountability system back to the State Board for a rewrite. And the Department of Education hasn’t calculated school letter grades for last year. 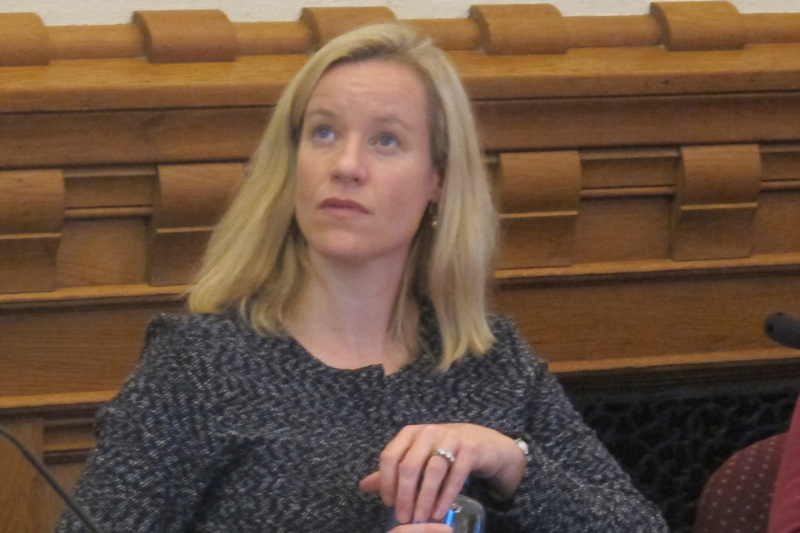 Adding to the confusion, says State Board of Education member Cari Whicker, is the A-F panel that’s been meeting all month working to overhaul Indiana’s accountability system. That’s why the 10 appointed members of the State Board sent a letter to Republican leaders asking for help from the Legislative Services Agency to calculate the 2012-13 grades. Board secretary Dan Elsener says waiting for the Department of Education to release the information has become untenable. Ritz has said she, too, supports LSA running a check on the school letter grade calculations. But she thinks the Department of Education should run the numbers first — and that the board should have made the decision to involve LSA in a public arena. Here’s the thing: Ritz is right when she says the chair of the board sets the agenda. * But the State Board members are also right when they say they’ve been tasked with setting education goals. For his part, Pence says he supports the State Board’s efforts to get letter grades to schools sooner. Dresslar says diffusing the tension will likely require the governor take a more active role. “At this point, since there’s such a toxic environment at the State Board level, it will start to affect the workings of the department and ultimately serving kids in the state of Indiana,” he says. 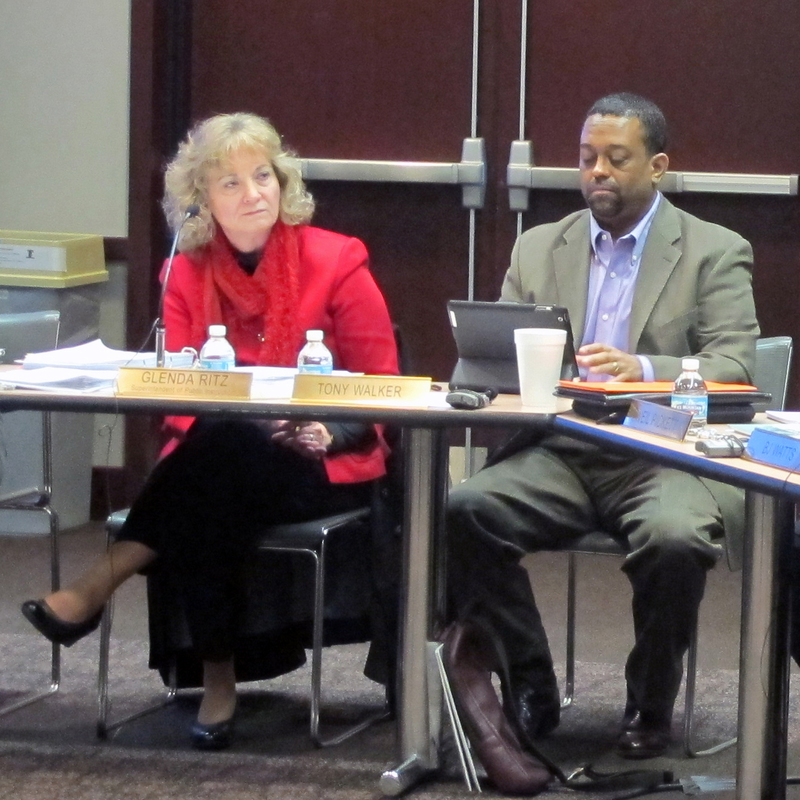 CLARIFICATION, 11:13 a.m. Oct. 31, 2013: According to a shared governance document the State Board agreed to in May, board members may also add items to the agenda. The state superintendent then distributes the final agenda.